None of them are “the best”. 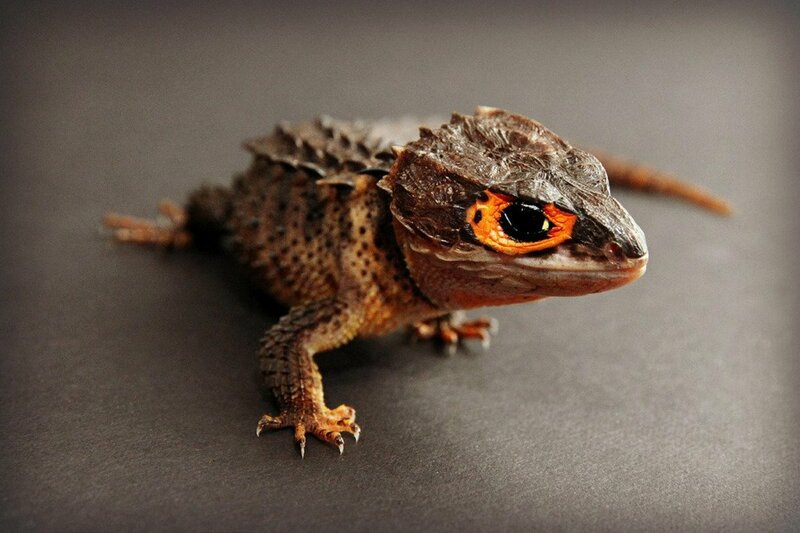 I have found the best, the perfect pet lizard. The best pet lizard is the Tegu. Actually, I keep several of these great pets around my house. My oldest, however, lives in my front room. His cage rests on the floor and when I am eating my breakfast I flip it open so that he can crawl out and lie in the sun with my dogs. When he gets bored (or maybe just warm-he has never told me which) he goes back to his cage and checks his dish to find out what is for his breakfast. Tegus are big, mellow, affectionate, easy to care for, and with a good diet can live about 20 years. Can there be a better pet? Is The Tegu As Tame As A Dog? No, Tegus are never as tame as a dog, despite some claims. They are the one of the most intelligent of reptiles, and even seem to be interested in humans, at times. Tegus do resist training, though, just like a cat. They can be as tame as a cat in several other ways. According to the animal behaviorist Patricia McConnell, one of the big differences between dogs and cats is the way they treat food. If a dog does not have enough, she will feed her puppies (or other dogs in the pack) and go hungry. A cat will take care of her own needs first. Tegus are like cats in that they always think of number one. They like to eat, do not care too much about what is in their bowl, and do not really care who is doing the feeding. One of the common complaints about keeping exotic pets is how difficult it is to feed them. Dogs and cats can be fed just by going out and buying food from the pet store. What about a Tegu? A lot of sites will recommend that the Tegu diet be composed of canned cat food, ground turkey, eggs, and calcium and vitamin supplements. 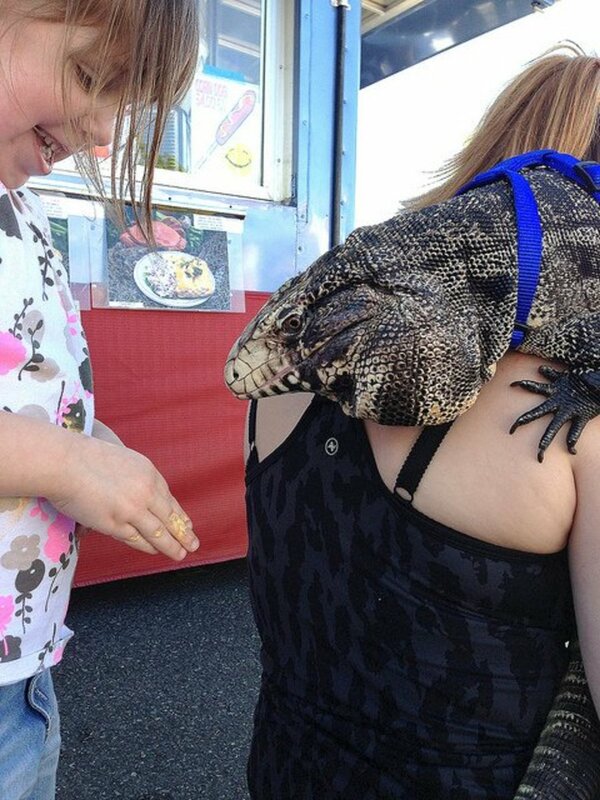 That diet is okay for a Monitor lizard, but not really needed for a Tegu. A study of what wild Tegus eat showed that about 2/3 of their stomach contents was actually plants and only a third made up of things like snails, crabs, and other small animals. This makes sense, as in the wild Tegus can usually be found at the base of fruit trees, picking up the fruit that has fallen, and looking underneath for worms or other bugs that they might find. Here are some suggestions for what you can feed your Tegu. Do not worry if you get things a little wrong. Tegus are forgiving, and not likely to develop nutritional diseases like Iguanas and some other lizards. If you feed your Tegu correctly, he may grow a little slower than those on a potent, high-protein, Monitor-type diet. He might also live longer. If your Tegu has been spoiled by a meat diet, and is relucant to eat veggies,you can make a small plate each feeding and cover it with a raw egg. My Tegu does wear a collar (around his waist, not his neck) and I leave it on him all of the time. I only put his leash on when he is strolling around the house or outside in the front yard. The leash is not really necessary in the house, since if he climbs under my bookshelf or bed my dog will tell me where he is at (if I ask nicely), but with the leash on I can keep an eye on him if he crawls into a hiding spot. When he climbs back into his cage I take the leash off. Some mornings I will take him out and let him wander around my garden when I am working. I leave his leash on and tie him to a banana tree so that he´ll have some shade. He likes this since he can be out in the sun but still hide if he wants. He does not care for the beach where it is open and he does not have somewhere to hide. In this he is very much like a cat—have you ever seen anyone take their cat to the beach? Are there bad things about sharing your house with a Tegu? If you do not handle your Tegu they can become aggressive. They have teeth that will slice through flesh and wild Tegus are responsible for a lot of the dogs in our area walking around with hunks missing from their noses. They need a large enclosure, or at least a decent sized cage and plenty of opportunities to get out and walk around. My geese do not like the tegus. I think it may be because of the long tail, or maybe it is that tongue flicking out every once in a while. I guess they think a Tegu looks like a snake and when a lizard is sitting in the doorway they will not even try to go inside. Tegus are not like a dog or cat in that they cannot be trusted with small animals. If you have a hamster, gerbil, or other small animal it must always be caged when your Tegu is strolling around the house. My parrot can handle himself in a fight but he always treads carefully when the Tegu is running around the house. But is a Tegu the best lizard to share a house with? Definitely. Is there anything I regret about having one of these pets? I just regret not getting a Tegu sooner. I have worked around Tegus since the mid-1970s but always thought there was another type of lizard or snake that would fit my family even better. I was wrong. Tegus are the best pet lizard! How would I train or at least show a Tegu who is the boss? You do not train a Tegu, and, whatever you do, you should not try the outdated "alpha wolf" techniques to show them you are the top dog. A reptile can be tamed, and can even perform simple tricks using operant conditioning, but you can not ask them to sit on command, nor can you force them to act correctly. Instead of being the boss, you should focus on being a good owner or a friend of your tegu. Feed him, let him run around your house, and spend time touching him. Think of him as a pet bobcat, not a dog. Is owning a tegu legal in California? According to the website tegutalk.com it is legal to keep them as pets in California. If you are looking for a source find someone in your area that sells the lizards and find out if there are any local laws. Tegus are available at herp shows in California too so you should have no trouble finding someone local. 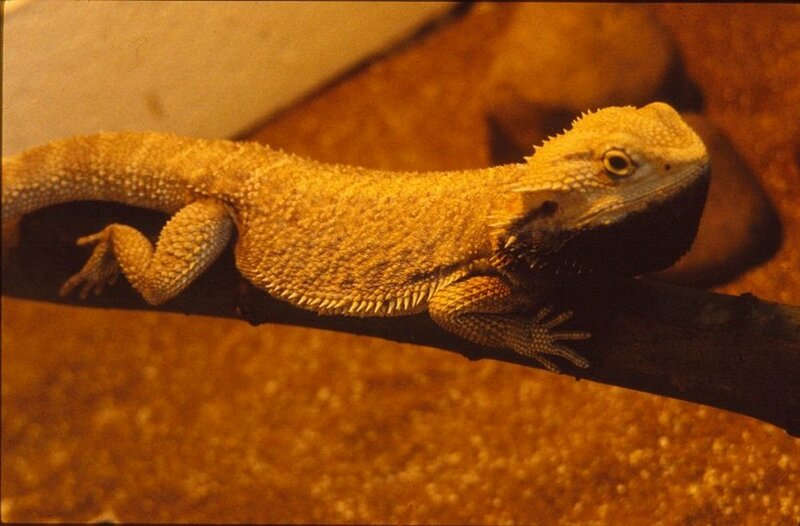 As a first reptile pet for a six-year-old, would you suggest an Argentinian B & W over a bearded dragon? The reason bearded dragons are selected as first pets for young kids is that they are small and not threatening. The same cannot be said of a tegu. I would not get one as my child's first pet. Does a tegu have sharp teeth ? Yes, their teeth are very sharp. They do not bite if handled, but in the wild, they use their teeth to defend themselves against dogs and other animals that attack them. I´ve heard that Rock iguanas are good. What about them as the best pet? Since all Rock iguanas are endangered species, they certainly are not a good option. 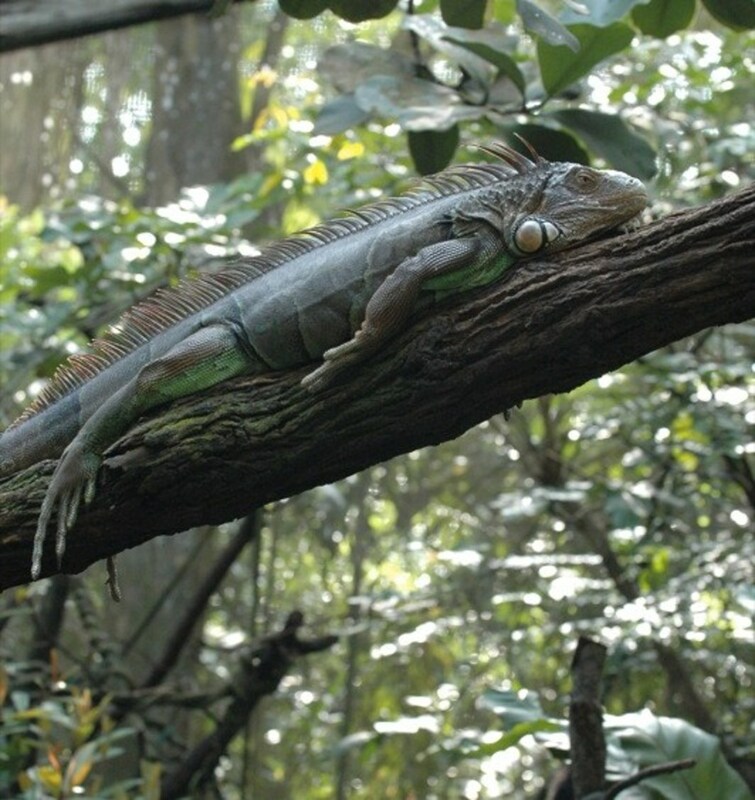 All iguanas, including those available in the pet trade, are herbivores and are a hassle to feed. Tegus are not. They do not interact that much with people, so a good pet if you want to look but not mess around with the pet much. The main complaint I have heard about chameleons is their short life span. What is the friendliest, tamest and most docile type of Tegu? In my opinion the Argentinian Black and White tegu is the tamest and best animal to work with. What cage do you use for your Tegu? Did you make your own? I made my own cage. It is a good idea, since Tegus are too large to use an aquarium and most of the containers that are sold commercially. Make sure that your cage is large enough for your Tegu and has high enough sides (or a lid) so that he does not crawl out. What species of tegu is the best, and what should a beginner owner start with? I think the black and white is best. Some people call it the Argentine tegu. It is fine to start with that species. I read a lot of articles about salmonella and reptiles--a lot of scary articles saying you have to treat everything the reptile touches as contaminated. How can you let them out to roam a house? Or hang out with them on the couch, etc? Are these articles over kill? I would not kiss my Tegu, let him up on the kitchen counter, or share utensils with him. His bowls belong only to him. Yes, I think those articles are overkill. I have heard of a case of a young boy gettig salmonella from kissing his turtle. Again, not something I would recommend. Would a huge dog crate be good for a white and black Tegu to stay in at night? That is a great idea for a short time period. Just make sure that the screen in front of the crate is small enough so that your Tegu cannot escape. What if you never took care of a lizard before, can you still get and start with a tegu? Even if you do not have experience taking care of a lizard, a Tegu is still a good animal to start out wtih. 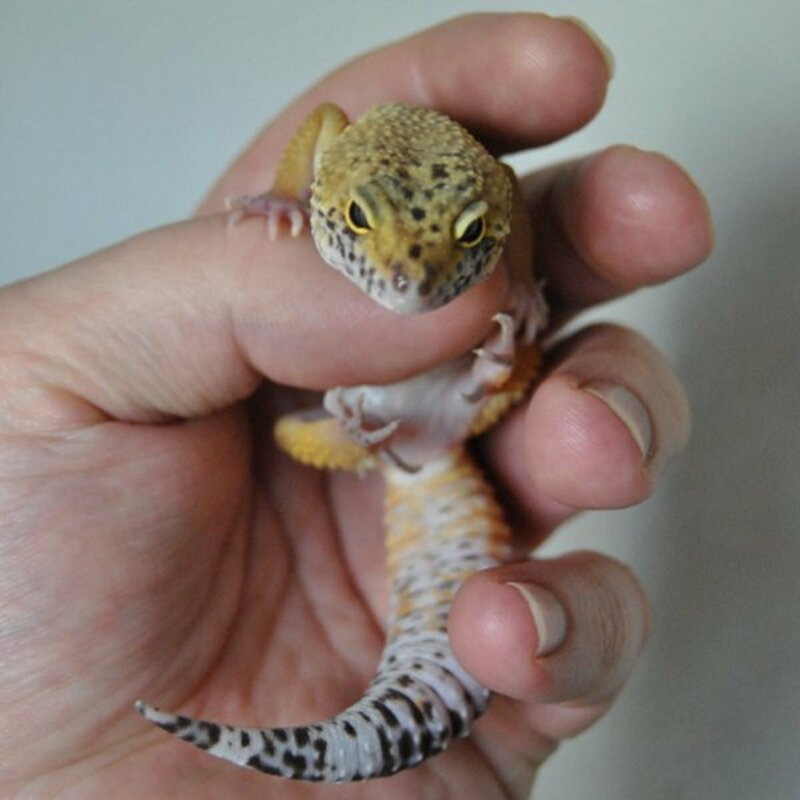 You do need to make sure you have adequate room for a cage, so some beginners will prefer a Leopard Gecko or Bearded Dragon since they are relatively small. Those lizards do require a diet of insects so can be a lot more work for a beginner. Is there a good book available for a lizard owner? There is a book about "Tegus as Pets" available from Amazon. Can you use a leash on a tegu? Yes, but I attach it to a collar that is around its body just in front of its back legs. If you put the collar on its neck, it will only slip out of it. Is the Tegu a rare and endangered animal? Tegu lizards are common. They are not an endangered species. If they continue to lose their habitat and the human population continues to encroach on their homes, they may become threatened. 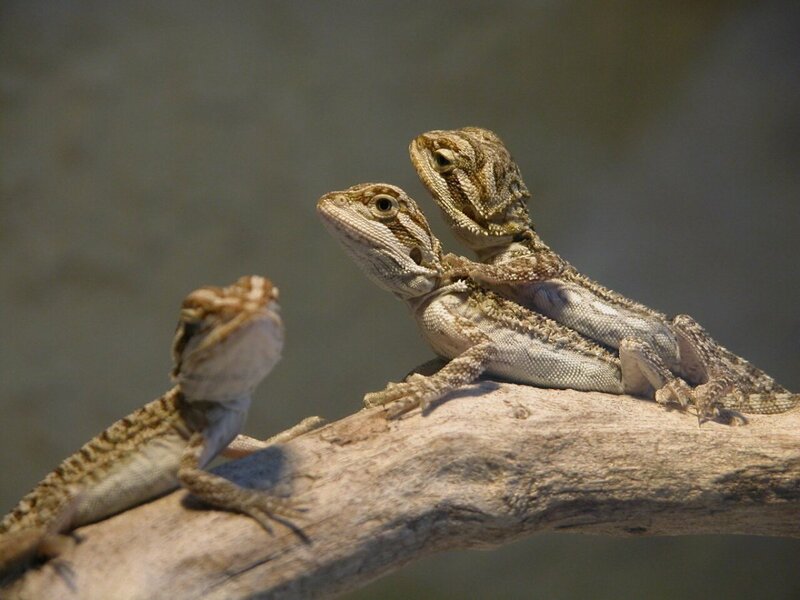 Many of the lizards available in the pet trade are bred in captivity. I am a reptile lover. I am looking for a friend or a pair of friends to help me deal with rats. Are any Tegus voracious rat eaters? No, I do not think they would be a good choice. A Tegu might kill a mouse, but if it was a large rat, he would probably leave it alone. A large constrictor might take care of them for you, but also might escape. I think your best bet to deal with rats is not a reptile but a dog. A small breed with a high prey drive (like a rat terrier, Miniature Pinscher, or a Standard Schnauzer) would be a lot better. What is better as a pet, an adult or juvenile tegu? Starting out, definitely a young animal. He will get used to your house, your other pets, your routine, etc. An adult is a lot calmer but may just want to stay in his enclosure all of the time. Where do the Tegus that roam your house poop? I have tile on the floor of my front room. They always go there; underneath my hammock where they won't be messed with. It is not a problem to clean up, but they are not housetrained like a dog. What do I do to assure my Tegu's health during the winter in Canada? Your Tegu will need to live inside your house throughout the whole year anyway, so there is no difference during the winter. If your house or apartment is colder during the winter, he will be less likely to come out of his cage, and will spend a lot of time buried in his substrate. I have had 5 Bearded Dragons and one gopher snake; am I ready for a Tegu? 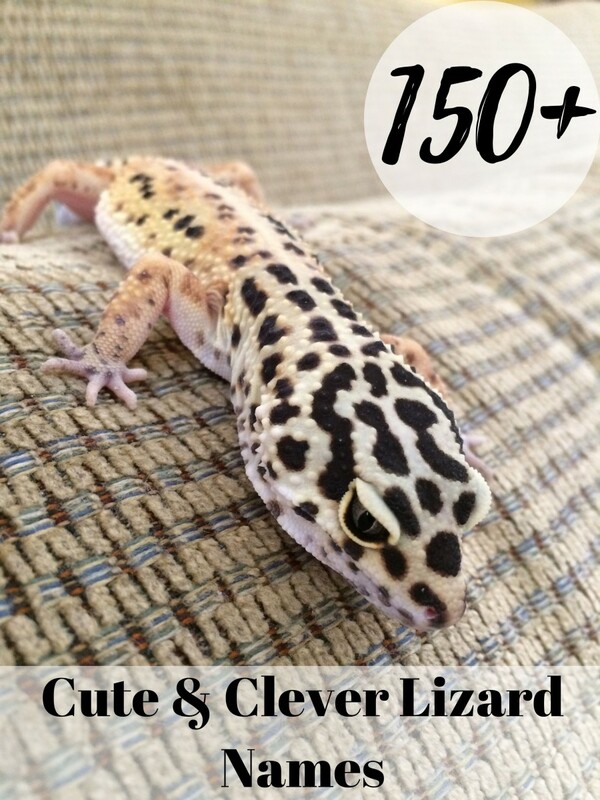 It sounds like you have plenty of experience and will make a great Tegu owner. Be sure to read all you can about diet, since feeding your Tegu can be easier than the other pets you have had, but should definitely be done right. Is a Tegu lizard good for beginners? It depends on the beginner. A Tegu can be a lot harder to handle than a Leopard Gecko or a Bearded Dragon because of his size. If you are concerned about feeding those little lizards, however, a Tegu is a lot better. I took care of a pair of Tegus when I was 12. Can I keep a Tegu if I live in a cold place? Your house or apartment is probably heated, so the cold will not be that bad if the Tegu is kept in an enclosure inside the house. So yes, you can definitely keep a Tegu even if the temperature outside is cold. He will also need supplemental heating like a heat lamp. It is important that you keep a thermometer to monitor the heat in his enclosure, and allow him to have a colder and a warmer area to move about in. They can get up to about 50 pounds, so imagine a pet as big as a medium sized dog. Can a Tegu and a cat be friends? Will they tolerate each other? Sure, since a lot of cats will lose their prey drive around animals in the family. Friends? I doubt it. Tegus ignore a lot but are not really "friends" with most other pets. Can I put a Tegu lizard in an open cage with no walls? Would that work? Can a Tegu thrive on an all mouse diet? Dan, as long as you do not mind the housetraining issue (a tegu will not use a cat box), he can run around your house. If you have carpet you may find yourself cleaning up after him more than you like. Brittany, as long as you are willing to go to the extra expense (like having a really big cage for your Tegu) they are okay to start out with. Best of luck. Jayden, Tegus are not poisonous or venemous. Are the Tegu lizards poisonous? Usually in private. What are you talking about? How does a Tegu handle #2 and #3? SariAn, sorry to hear about your dragon. Tegus get pretty large, which is why they are not the best pet for people that do not have room. Figure on at least a meter and a half. They are not sexually dimorpic. I guess your Tegu would eat crickets, too, but you would probably have to mix them in with his food! This has made extremely interesting reading. I must admit I had never heard of the Tegu - being firmly in the Beardie Camp for many years. We sadly lost our 9yr old Bearded Dragon (Noddy) very recently following a short illness and a friend told me to look up about the Tegu. I may be sold on the idea but would love to know what length they can be expected to grow up to and is there much difference in size and temperament between the males and females? Their diet seems fairly relaxed, if it means we don't have to have crickets chirruping 24/7 that would be another bonus (although it makes sunny England feel a little more Mediterranean!!). Ann, I personally do not feel it would be a good idea to release Tegus into the Everglades. It might happen anyway, as they escape from the pet trade, but it is certainly not something that I would want to do on purpose. While tegus are a threat to small dogs and cats, same as alligators, apparently, they are not a threat to people. If I am living in Florida with my grandchildren visiting, I think I'd rather look out on my lawn and see a tegu rather than an alligator!! I commend the author for actually recognizing that cat food is legitimate tegu food. So many people claim that it can only be raw food. Others have the same superstition about humans. My tegu is thriving on cat food. I do go out of my way to buy the kind made for silly human "pet parents" who want their carnivorous cat to have peas, carrots, greens, potatoes, and rice. Foolish to give a cat, but my omnivorous Argentine red tegu loves it. Also, I don't force him to eat foods he doesn't like. Most vegetables, for example. It's silly to mash up food a pet doesn't like in order to mix it with food they do. Nobody mommies their diets in the wild, and they get along just fine. My own tegu has roam of the house whenever he wants it. He clambers out of his tank about once a day and goes wandering around, maybe comes and stares at me until I feed him, and/or then either goes off to wander around and end up sleeping somewhere, or else comes back and stares at me until I put him back in his tank. 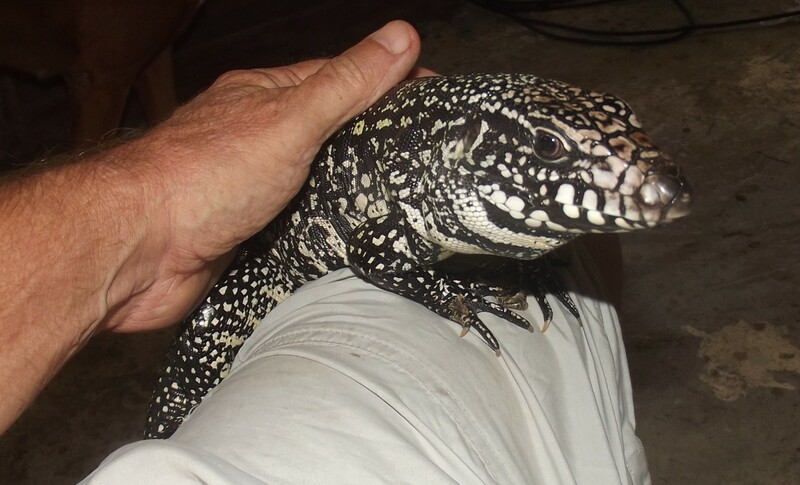 What is the size of a argentine black and white tegu? A lot of cats will lose their prey drive around animals in the family. Friends? I doubt it. Tegus ignore a lot but are not really "friends" with most other pets. They are not dangerous. are they dangerous to them? That's pretty awesome. I had not heard of such a lizard! Looks like a great pet! I have dogs and cats, they might now appreciate a lizard. I wonder what those animals think? I was given Dobie Houson's book Devotion which is about communication with our pets. I would love to know what that lizard thinks!! Lily, I keep the collar around his waist because the neck is too thick and he would just slip it off of his snake-like head. They dig a lot, so no need to clip nails. Also you will not need to brush teeth. I took care of a pair when I was about 13, during breaks from school, and they do okay. They were classroom pets so were used to a lot of noisy kids coming into the class and looking at them every hour. Handle as much as possible, No problems with the rain, just make sure he has a large cage and somewhere to dig under to get away from it all. If I take my Tegu out in the yard (for a walk), he gets worked up because of the sun. I would not recommend that, just give lots of freedom at home. •Are baby tegus to be handled? •Is a tegu able to adjust to a different environment tenporarily (holidays, for example). •Do baby tegus take a while to get adjusted to their environment (for example: you can't handle them for the first few weeks)? •If well-researched, can tegus make good first pets for beginners? •Do you have to cut tegus nails/brush their teeth/mist bath them? •Do tegus panic when it starts to rain (I live in England, so this is a major issue)? •Are tegus Agressive towards dogs generally, or can a bond be formed from a young age? •I have noticed your tegu wears a collar around it's waist - is it dangerous for a tegu to have a collar around it's neck? •If a tegu is taken on a walk in an area with lots of hiding spaces, will it be happier, more likely to escape or just grateful for the freedom? This was an interesting read Dr Mark. I'm a reptile lover my self, have a Burmese Python and a Horned Lizard. I've seen a couple of animal shows on Tegu's in Miami and they are portrayed as being very aggressive and will bite off fingers. Guess I should do a little more research on them. When they escape out into the wild, they breed and become invasive species. See: Florida. My son has a black and white tegu he got at a trade show over a year ago that was almost full grown. He keeps it in his room in a 6 by 3 foot cage. The smell is overwhelming when I open the door. I am constantly on him about cleaning the cage. It must be unhealthy to live with that smell in the room. To make matters worse he tells me he has a hard time handling it because it is so aggressive. I'm almost at the point of forcing him to give it up. Is there anything that can be done at this point to calm the tegu down so he can handle and enjoy having it and not be afraid of it every time he opens the door to feed it? The smell is the biggest concern for me and if there is a health hazard for my son in sharing a room with it. Is it a bad idea to keep it in his room? Even with the smell and not being able to handle it my son is adamant about keeping the lizard. Ethan, as long as you have plenty of wood shavings or leaves he will dig down and feel secure and happy. A normal cage will do for that. I am not sure if there are any laws against Tegus in Canada, but I doubt it. As far as him doing well in your house, as long as he has supplemental heat he will do fine there. Hi jk1987 the size really depends on how often you are going to let him out to run. An adult needs at least a meter wide, a meter deep, and about 1.5 length, but you can get by with a cage that small only if it is open and your Tegu gets out to exercise. Most of the enlcosures recommended are larger, so even if you get a baby remember that these guys get really big, and if you do not have the space a small lizard is better. I live in the tropics so do not worry about humidity, but if you are in a drier region you need to get a humidity guage and keep the cage at about 80% humidity. The bedding needs to be sprayed to stay moist, and Tegus like to get in the water when they can (just like Iguanas and Basilisks). Hey, so I really want a tegu for obvious reason but I want a baby one so it can grow up with me so I was wondering when do baby tegus hatch, so I can know when to keep my eye out on the web. Calcium supplementation can be dangerous. If you are giving calcium supplement make sure it is only sprinkled onto his food. What kind of diet is he on? 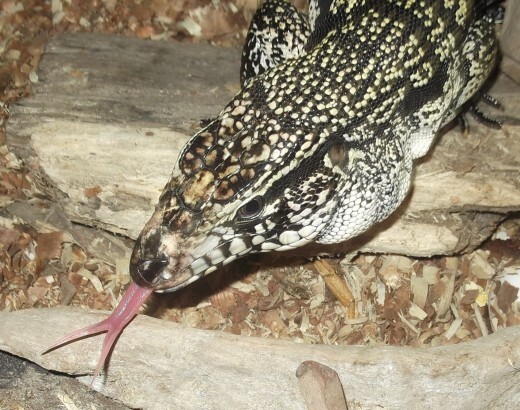 If he is on a good Tegu diet, and is eating whole food like mice, newly hatched chicks, and guppies or other small tropical fish, calcium supplementation is not needed. In any case, it should not be more than 1% of his diet. We humans are likely to give too much, not too little, and if you give too much calcium supplement he is likely to have kidney stones and hardening (calcification) of his internal organs. Sometimes it can cause constipation also. Does he have a sunny spot he can sit in when he does come out? I hope you have changed his diet so he can heal naturally. Good luck. 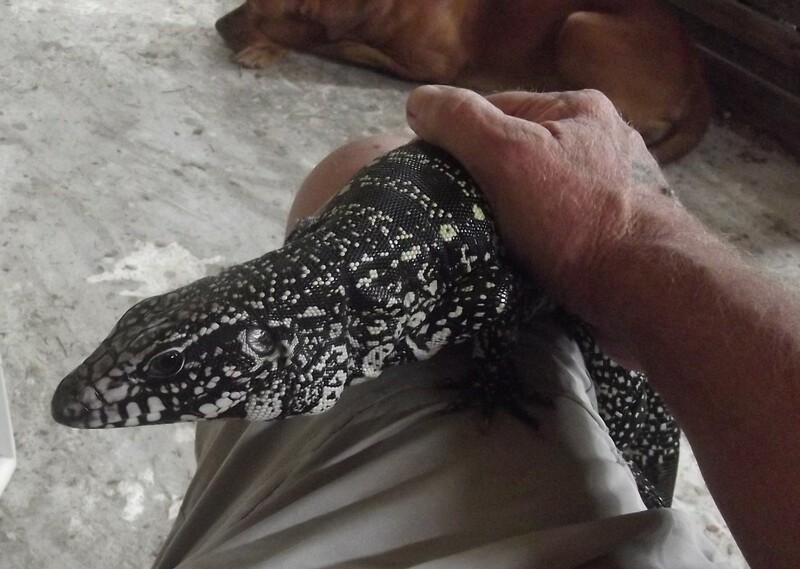 Hi, ive recently adopted a rescued argentian black and white tegu. His feet have grown weird due to a calcium deficiency and he obviously hasnt been handled much. Im giving him calcium powder daily and calcium/d3 supplement 2x weekly. Would you have any advice on nursing him back to health? Hes a little skiddish in his enclosure but once hes out and about hes a sweet heart. Hes already part of the family and i want to get him back healthy. Thanks! Steven, not sure what you meant about height. As far as width, it does not need to be much as long as he can get out and walk around your room. Leave the cage open all the time with plenty of wood shavings as bedding and when he feels the need he can just go in there, burrow down, and escape from it all. These guys are a lot easier and cheaper to feed than a snake. You can buy a dozen eggs and feed him cheaply, mix it up with some fruit, veggies, and a cheap canned cat food. The cheaper the better since there are more fillers! To ? ?, I deleted your comment because of your use of nasty language. If you are not able to leave a comment without swearing then I am not going to post it. Just in case you were not aware, there are good and responsible people out there who have never owned a Tegu before. Heather, potentially all reptile pets can carry salmonella, but it is not really an issue unless you are immunocomprimised, like to give your Tegu open mouth kisses, or are used to sharing a feeding dish with your Tegu. Seriously, it is not something to worry about. Use common sense by washing your hands after handling your herps and you will be fine. Great article! I'm just curious to know, do Tegu lizards carry samonella? I know some lizard species do carry it, but I've heard it's more prevalent in amphibians. Having a hard time finding that information. Izzy, we have a dog problem all over the world because inexperienced and irresponsible people get dogs and let them loose when they become large and less fun to handle. Does that mean that only experienced people should get dogs? We have a Tegu problem in the Everglades because of inexperienced and irresponsible owners that let this animals loose when they get too big. Please don't get this as a pet thinking it's like a cat or a dog, this is a large lizard and if you are not experienced with it, it will be too much for you to handle! What are your thoughts on how irresponsible exotic pet enthusiasts are allowing non-native species such as the Tegu to get loose and harm native wildlife stocks? HELP! i live in oregon and im not sure where to get a Tegu! anyone know where i can????????????????????????????????????????????????????????????????????????????????????????????????????????????????????????????????????????????????????????????????????????????????????????????????????????????????????????????????????????????????????????????????? New breeder: Good luck to both of you! Hi again, Yes, I'll certainly check out Pinterest for your tegu pics. I don't think I've ever seen one in any of the Australian zoos I've visited. You're right - often the response to telling people I have pet snakes is "Eww, gross" or an expression of pure horror. Reptiles are fascinating, not gross. Oh, they do well without the worms or cat food! That is the best part of the beasts, as they will eat about anything--guinea eggs from my incubator, hot dogs, etc. I have offered mine several types of seafood but he does not like that, for some reason. They are native here to South America or would probably be banned here too. I know you guys have a lot of great Monitors in your part of the world, but I am happy we have the Tegu over here and would not trade them for any other Reptile. Check my Pinterest page when you get a chance. I have a group board about Tegus and there are some really good pictures on it--a lot better than the ones on here. It is nice that someone from HP read this without saying "Ewww, gross." I imagine you get that a lot when other hubbers read about your snakes. Thanks so much for that nice comment, Teresa. Hearing from people like you makes all of this effort worthwhile. great stuff!!! I too think you should write a book. I would lobs to hear your story. In the meantime, the info you offer about animals is great. You keep me company a lot. Tegus seem to have a "live and let live" attitude, Alphadogg, so if my dogs don't mess with them they never mess back. There are some hunting dogs around here missing chunks out of their noses, however. Burmese Pythons are getting a lot of bad press. I expect to see more laws against them in the future, and legislators up your way telling us how they are the Pit Bull of the reptile world. Take care of Buster and keep him under wraps. Great hub Doc, I am also a reptile lover, I have a 9 ft Burmese Python named Buster that I absolutely love. I don't have a lot of knowledge/experience with the Tegu. I did watch a documentary about how they (along with the Burmese & African Rock Pythons) were a problem in Florida. The showed perceived them as extremely aggressive, & with those teeth, I would want my kids/dogs losing a limb. Thanks grand old lady! Even if you are not a reptile person (is there such a thing?) I hope you liked their pictures. Despite Bob´s comment on their being "underwhelming", I think they are pretty fantastic. If you are into that sort of thing, of course!!!! The article is very interesting, and your home sounds most intriguing. Interesting read. I was a zoo docent in the 90's and we had a tegu as one of our education animals. My knowledge of them was limited to bullet points (range, habitat, diet, reproduction, etc.). Had I known they were as much fun as you indicate, I'd have worked with our's more. I preferred to work with our ball python, emperor scorpion, or red phase screech owl because they elicited a greater response from the public. The tegu, unfortunately, seemed to underwhelm people. Voted up and interesting. I never heard of them, so thank you for sharing! 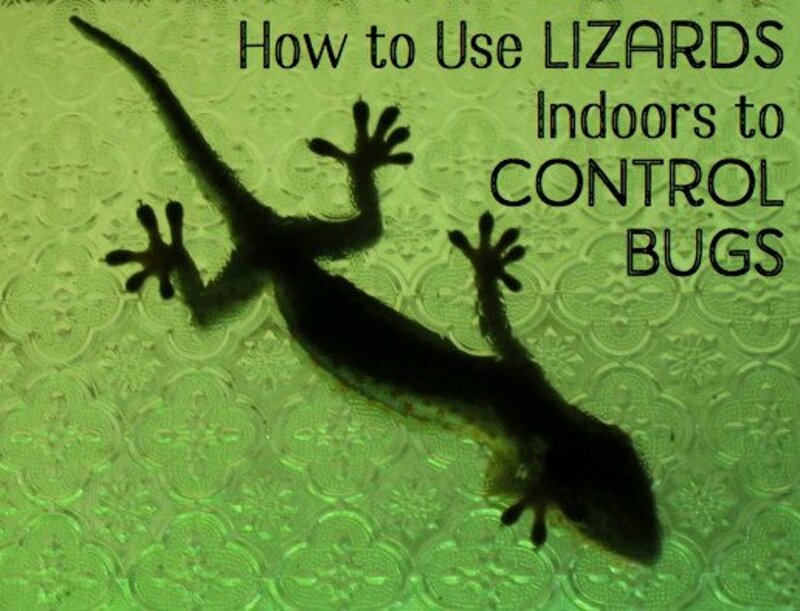 I think my house is currently capped with three dogs, and I don't know much about caring for a lizard, but for someone who does, this is a very educational hub. Voted up! You need to put all of this in a book, Doc!